What: Burgers rank pretty highly on the hangover cure scale. 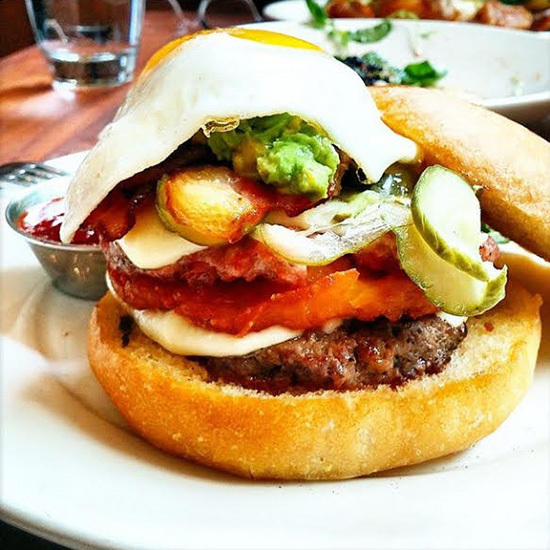 But the Bluestem Brunch Burger is something else entirely. Let's break this down for you: a beef patty. Hash browns. A breakfast sausage patty. Bacon. Bluestem's house-made version of American cheese. A fried egg. Pickles. Avocado. Spicy ketchup. All in one formidable, barely cohesive, sandwich-like stack. It's the Captain Planet of hangover cures: powerful alone, unbeatable together. Wash it down with: Opt for a classic Bloody with a barbecue salt rim or the lemon-grapefruit-rosemary Gin & Juice.